Square Enix has kicked off an official giveaway on their Octopath Traveler Twitter account. The giveaway is to celebrate the 100,000th person signing up for their upcoming Octopath Traveler smartphone game. 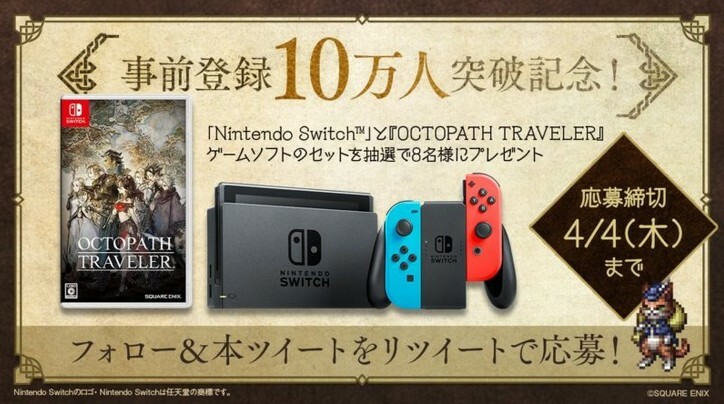 In this giveaway, up to 8 sets of Octopath Traveler and Nintendo Switch consoles are up for grabs. You have until April 4, so good luck!